Everything you said about Border Collies is true for my BC. I knew from books and TV specials that this breed could be trouble, but having rescued her in a very small town with a kill-pound, turning her over to the city dog catcher was not an option in my eyes. I have had her for almost 4 years now and constantly have to adapt to her anxiety and neurotic tendencies. I’m starting to train her with the help of a trainer and some good advice. I strongly urge others who love the breed but do not have the time to spend with them not to get a BC. But if you do, expect an affectionate loyal friend who needs a lot from you and will not lie quietly in the corner for you. You have to be very active with them and give them all the exercise and work they need to be happy. Hi I just bought my BC a couple days ago from the local humane society. She is two years old and im having problems with her herding me. She follows me everywhere. And she has a barking problem. This could be separation anxiety? But I don’t exactly know what to do. She is a border collie Labrador mix. I have a border collie three months old which will not walk on a leash no matter what you do? Do you mean that your Border Collie will shut down if you attach a leash to his collar? Try using a harnas instead of just clipping the leash on the collar. I had the same problem; once I used the harnas I didn’t have any problems. Hi, Just want to tell you what worked for me. My BC was totally negative to the leash. I do not regularly use treats to train my dog. It makes your dog over weight. But I got a treat and put him on a leash and showed it to him as I started to walk and HE FOLLOWED ME. THAT WAS IT AND NOW HE GOES TO IT WANTING TO GO! Praise and love+exercise. I recommend & I cant stress enough you need to spend time with them Don Sullavins Perfect dog training Method. It is humane and rewarding.No treats for rewards and again, Praise and love+exercise. I just bought a BC I found putting her outside every ten minutes helped train her to ask for the door. Make sure her put her right out after drinking I found they can not hold it as long as other dogs can. Hi, in your last paragraph you mentioned about socialization. My border collie got bit at a training group when he was 4 months old and we never went back to another training group. He is no aggressive to any dog passing, I am thinking of taking him to a training group to surround him with plenty of dogs. Should I get a muzzle just incase, my idea is that when he is acting aggressively he will realise his behaviour does not get rewarded as he will not be removed from the situation of being surrounded by other dogs. Hi Mark, first off, if your dog is not currently aggressive towards other dogs, why try to fix something that isn’t broken? Also, socialization doesn’t mean being thrown in there with a bunch of other dogs. It means *positive* experiences with other dogs. Your dog will develop a meaning on whether interactions with other dog is pleasurable or painful depending on those interactions. You need to let your dog play or socialize with other dogs who are very well behaved and tolerant of other dogs. Not just any random dog. The goal is to get your dog to see all dogs as pleasurable based on his or her experiences. hi i have a 13 week old border collie pup she bites quite a lot and we try everything to make her stop and not do it again but she keeps on doing it and also i have 9 cats/kittens and she intimmidates them and chases them up the stairs to get rid of them how do i make her stop that ? …. I bought a Kong chew toy and have had a lot of success. Also rawhide flavored rolls work well. A lot of the time it seems she wants to play but doesn’t realize she’s hurting you. What if you say “no” and exchange a toy to bite instead? I’m definitely having the same problem. I just got my puppy 3 days ago and he is 4 months old. He has a problem with barking while I am away at work and it is causing a problem with the other tenants and I might lose my apartment. Also, I am having trouble getting him to potty outside..I have tried to use treats and positive encouragement but nothing seems to be working. Any suggestions?? How much time is he able to exercise? Border Collies tend to get a little over energized and annoyed when they don’t have space or time to just run around. I have a 5 month old BC I’ve had for a week. She’s my first dog. We’ve been going on walks that range from 15 minutes to a few hours (with breaks). She doesn’t seem over-exercised, but I want to make sure I’m doing okay. My husband works most of the day, but because of his size and command he is definitely the alpha when he’s home. I’m fairly small and play with her more often, resulting in a lot of biting and her seemingly “dominating.” I’m not sure how to assert myself. Tips anyone? Hi Maria. Don’t worry about over-exercising your dog, I seriously doubt that you will over-exercise your dog by going on long walks. I think this is a good habit that you are developing and your dog will really enjoy it later on. But of course, make sure that you bring lots of water with you (and training treats). As for your dog biting and “dominating” you – I don’t personally think there is such a thing as your dog trying to dominate you. Instead, your dog is just learning what is appropriate and what isn’t. 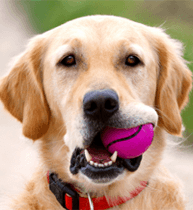 You say that you play with your dog and then he bites you – there must be consequences for this action to get your dog to stop that behavior. Lastly- we crate train her overnight which works well. She is alone for 5-6 hours during the day… Is the crate okay? So far she hasn’t made a mess in her crate when were asleep or at work. When is it okay to let her roam a small part of the house when I’m working? Yes that is fine. To be honest with you, it totally depends on the dog but I would not hurry this process. You said you’ve only had your dog for a week, you should only let your dog free in the house when you are absolutely certain that he won’t be digging in the garbage, chewing on your stuff or soiling your house. I’ve crated my dogs for almost an entire year when they were young (for short time periods when I wasn’t home). I did this because I wanted to supervise my dog whenever they were free in the house. Now I can let them free when I leave but there was a very strong history of good behavior in the house. They never even chewed anything of mine (not even once). How did you train them to stop chewing? I got my puppy saturday, he turned 8 weeks sunday. He is very active, I am trying the crate training and even when I am home if I need to shower or am going to be in the middle of something where I cant keep my eye on him I put him in the crate. For the most part when he comes out, he goes out and goes potty and if he goes potty he is rewarded with a treat and then left out to play up until he either tires or starts to get into trouble. If it’s for trouble he goes in until he stops whining then gets another chance to play. If when I take him out he does not potty he goes back in the crate and I try again in half an hour. He loves to play outside in the backyard but if I am not out there playing with him he whines and yelps even though he has toys to play with and things to chew on. I know they need a lot of attention at this stage but I also work so while I can work from home for the next few weeks that won’t always be the case. When he gets to playing inside with his toys, playing fetch, chasing the cat, etc. he does really good for a little while and then he starts in on chewing. He will chew anything and I mean ANYTHING. Even outside he is chewing on the curb and stuff like that. I’m sure that is part of teething but when he gets into playing he will start chewing on me. I tell him NO in a stern voice and redirect him with a chew toy. If after doing this 4-5 times he is still trying to chew on me he goes into time out to wind down and then the cycle starts again with coming out of the crate to try going potty. I am fortunate to have my back half of the house with hardwoods and am able to gate off that area. I will be pulling up the 2 area rugs I have and store them for a while so that they don’t get ruined by potty and chewing but even when he is left out back there to play, if someone isn’t in there with him he whines and yelps. I am sure this will calm down as he gets used to his surroundings but any other tips/tricks you have especially where the chewing is concerned would be great. Try a bark collar but only for short times that should help we used that on our older dog who would bark all the time it took only a couple of times and it stop him .